Lapointe, Pierre Louis. "Saint-Raymond". The Canadian Encyclopedia, 04 March 2015, Historica Canada. https://www.thecanadianencyclopedia.ca/en/article/saint-raymond. Accessed 19 April 2019. 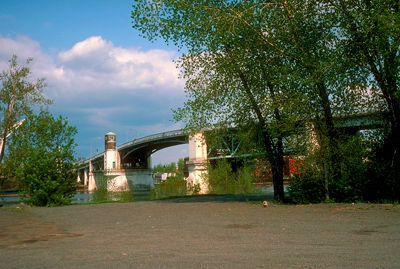 Saint-Raymond's industrial activity has always been closely linked to the forest industry. Sawmilling, pulp and paper, wood products, house and cottage manufacturing as well as charcoal production, are still key economic activities. Saint-Raymond, Qué, Town, pop 8836 (2001c), 8733 (1996c), 8126 (1991c), area 670.58 km2, inc 1995, was created when the town of Saint-Raymond (inc 1957) merged with the parish municipality of Saint-Raymond-de-Portneuf (1855). Located about 50 km northwest of QUÉBEC CITY, Saint-Raymond is an industrial, commercial and administrative centre of the regional county municipality (RCM) of Portneuf. The town has a picturesque setting, with a backdrop of mountains and lakes and with the Rivière Sainte-Anne flowing lazily through its centre. The entire RCM attracts fishermen, hunters, nature lovers and vacationers from all over the Québec City area. Saint-Raymond's industrial activity has always been closely linked to the forest industry. Sawmilling, pulp and paper, wood products, house and cottage manufacturing as well as charcoal production, are still key economic activities. Two other very different fields of endeavour are a glove and leather factory and a cheese factory, Fromagerie Cayer, where visitors are invited to look in on the manufacturing process and to sample some of the cheese. Saint-Raymond is the birthplace of Louis JOBIN, a renowned sculptor.